Rumors that the Obama administration plans to accept his proposal to classify the Islamic State's (ISIS) atrocities against Yazidis, Christians and other groups as genocide are encouraging, former U.S. Rep. Frank Wolf told the Investigative Project on Terrorism. "The administration from what we can gather is taking this very, very seriously," Wolf said. Wolf, a former Republican congressman from Northern Virginia, doesn't agree with the Obama administration on many things, but the genocide issue may be one in which common ground is in sight. "I commend them," Wolf said. "I'm really pleased that they are moving ahead and doing this, but now that the administration is doing this, Congress ought to do something." A bipartisan resolution pending in the U.S. House describes crimes being perpetrated against Christians and other ethnic minorities in Iraq and Syria as genocide under international law. It calls on the United Nations to "to assert leadership by calling the atrocities being committed in these places by their rightful names: 'war crimes', 'crimes against humanity', and 'genocide'." In September, Wolf sent a letter to Attorney General Loretta Lynch asking that the genocide label be applied. He also asked that the U.S. prosecute ISIS's self-proclaimed caliph, Abu Bakr al-Baghdadi, and Mohammed Emwazi, aka "Jihadi John," for killing American journalists Steven Sotloff and James Foley, and American aid worker Kala Mueller. That was before a drone strike in Syria killed Emwazi last week. Wolf interviewed 75 Yazidi girls last winter during a trip to the region with the 21st Century Wilberforce Initiative, where he is a distinguished fellow. "When we got back, it was clear to me that what we saw was genocide, particularly against the Yazidis, but even the Christians," Wolf said. In addition to the Yazidis, Shiite Muslims and Turkomen also are genocide victims, Wolf said. Wolf's quest received an added boost from the U.S. Holocaust Museum, which issued a report last week also calling on the administration to label the atrocities against the Yazidis as genocide. "Our findings also suggest there is sufficient reason to assert that in addition to committing crimes against humanity and war crimes, IS perpetrated genocide against the Yezidi population living in Ninewa in August 2014. The determination of genocide against the Yezidi population is based on a preponderance of the evidence, and does not reflect the standard necessary for individual criminal responsibility. Any formal determination that genocide was perpetrated needs to be made by a court and based on careful consideration of the evidence." Word of the pending White House action came last week from Yahoo! News reporter Michael Isikoff, who reported that an announcement calling ISIS atrocities a genocide could come in the next few weeks. Internal discussions are underway at the White House, State Department and on Capitol Hill regarding the implications of such a declaration. "It would help trigger the indictment of ... Al-Baghdadi," Wolf said. "Al-Baghdadi was directly responsible for the deaths of the four Americans, including the assault of the poor woman from Arizona. "That would almost have to follow through because it would force the Justice Department ... to indict Al-Baghdadi." 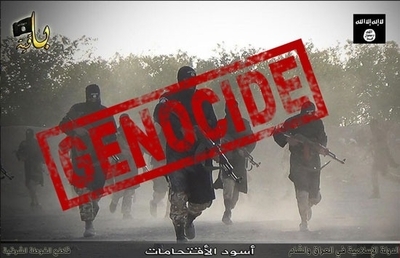 A genocide declaration would open the way to prosecuting anyone who helps ISIS. It also could pressure the U.N. to similarly classify the atrocities as genocide, Wolf said. Such people could be brought before the International Criminal Court in The Hague for war crimes tribunals similar to those that followed the Holocaust or the Yugoslav wars in the 1990s. "Anyone who did anything at all would be guilty of genocide," Wolf said. "They would be a participant in genocide, so that will kind of chill a lot of the support for ISIS." This could potentially ensnare the ISIS supporters in Qatar, Saudi Arabia and even Turkey, the latter of which failed to stem the tide of foreign fighters into Syria. Numerous people warned Wolf during his trip of Qatari funding for ISIS. Wealthy Qataris who bankrolled ISIS's predecessor, al-Qaida in Iraq, have maintained their financial support for ISIS. U.S. authorities repeatedly have cited Qatar for its failure to crackdown on terrorism financing. "Qatar's overall level of [counter-terrorism] cooperation with the U.S. is considered the worst in the region," a top level State Department official wrote in a secret Dec. 30, 2009 State Department cable. Saudi citizens "have funneled hundreds of millions of dollars to Syria in recent years, including to ISIS and other groups," Washington Institute Fellow Lori Plotkin Boghart wrote in a June 2014 report. A declaration also could turn those involved in black market ISIS oil sales into accessories to genocide. "Trucks are rolling out of ISIS-controlled territory up into Turkey," Wolf said. ISIS earns an estimated $50 million per month from selling oil, Iraqi and American officials told the Associated Press. Turkey's shadowy intelligence agency, MIT, is alleged to be helping manage ISIS's oil smuggling operation. Wolf also condemned Turkey for failing to shut down the flow of foreign fighters into its territory. "Anyone aiding and abetting [genocide] could be prosecuted," Wolf said. Government officials aren't saying which minority groups will be covered by any genocide declaration, Isikoff wrote, citing an unnamed Obama administration source who said atrocities aimed at Christians, Shiite Muslims and others were likely "crimes against humanity." However, the source claimed those acts did not appear to meet the U.N. genocide treaty's standard — "that the perpetrators have the 'intent to destroy, in whole or in part,' an entire 'national, ethnical, racial or religious group.'" "There is no doubt that that designation meets the parameters of the definition of genocide because of the declaration by ISIS that they wanted to wipe them (Christians) out," said Zuhdi Jasser, president of the American Islamic Form for Democracy. "Their policies really do not fit together. "This designation becomes meaningless if it's not applied in a consistent and rational way," said Jasser, who also serves as vice-chair of the U.S. Commission on International Religious Freedom. " Christians must be included in any final declaration, Wolf said, but added that he was unaware of any effort to omit them. A State Department spokeswoman would not comment on which minority groups might be covered in a genocide declaration, saying the agency did not want to "comment on any internal discussions." "We certainly continue to be horrified by ISIL's atrocities against the Yazidi people, as well as its continuing appalling atrocities against other minority communities including Christians, Shabak, Turkmen, Sabean-Mandean, Kakai and other minority populations through its horrific campaign of murder, kidnapping, sexual slavery and forcible transfer of populations," State Department spokeswoman Julia Mason said in an e-mailed statement.